What Are The Shy 5? Have you ever heard of the Shy Five? Completely and utterly different to the Big Five, you’ll have to get up early to see this alternative game-viewing list. Keep a sharp eye out, because these animals spook easily and keep a very low profile. But they’re well worth the trouble. At De Zeekoe Guest Farm, these self-effacing charmers await you. 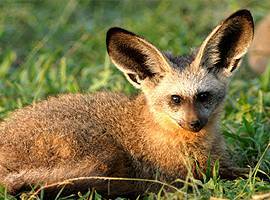 They are: the meerkat, the aardvark, the porcupine, the aardwolf and the bat-eared fox. All are nocturnal beasts except for the meerkat. 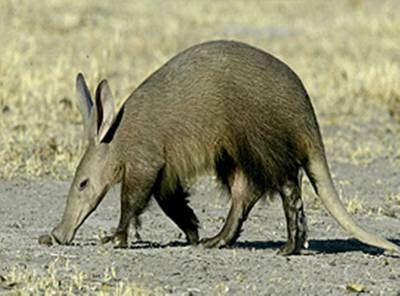 The strongest of the group is the aardvark, a powerful termite-eating digger that uses its formidable excavation prowess to break open ant hills or dig an escape route. Its old holes are often renovated and occupied by all other members of the Shy Five. 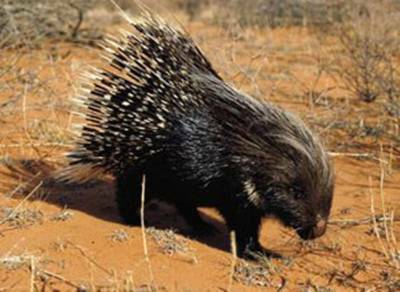 Porcupines are, a large, quilled rodent that devours juicy bulbs, warding off danger by stamping its feet and rattling its black and white quills. If that doesn’t work, it will charge in reverse, driving its painfully sharp quills into predators. 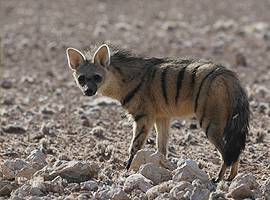 The aardwolf looks like a miniature, striped hyena at first glance, but this dog-like animal lives on a steady diet of termites. Its jaws are most unhyena-like – small and weak with peg-like teeth. It frightens away attackers by puffing out its huge mane, and making scary roaring noises. Another doggie character is the beautiful bat-eared fox, with its fluffy tail, robber mask face and huge ears, all the better to hear bugs with. This insect-muncher will stand peering at the ground, detecting every tiny twitch of larvae or beetles underground. It digs them up with its elegant, black-stockinged forelegs, then trots on, usually with its family. And then there is the ever-photogenic meerkat (another insect-lover). At first glance this seems like the odd one out among the Shy Five. Yes, and there are meerkat troops that are habituated to humans. (Meerkat adventure tour at De Zeekoe Guest Farm). But usually their superb sentinel skills send them scampering down a burrow at the mere sight of you. The meerkat tours are at sunrise everyday (except Christmas day) and bookings are essential. Only 7km outside Oudtshoorn, in the Garden Route’s Klein Karoo, surrounded by the famous Swartberg and Outeniqua mountains, is one of the world’s 17 “hot spots” with 3 overlapping flower zones. Surrounded by a variety of Oudtshoorn Attractions like ostrich farms, longest wine route in the world (R 62), Cango caves, Wildlife ranch, waterfalls and museums, makes this the ideal destination for a visit or a stay over in the Klein Karoo.